Well, once again… I wish I had better photos, but I run solo and recording with a cell phone with sticky fingers and angry bees is usually a bad combination. Anyway, here is a nuc that contains the first split of the 2015 season as I try to grow my apiary. I am recovering from the loss of my strongest hive earlier this spring and trying to expand to at least 5 hives this season. The weather has been a bit tricky so far. The early spring season still saw temps dipping too low in the evenings for splits. I went ahead with this one, even though I was not too thrilled with the timing of the weather and the brood cycle. 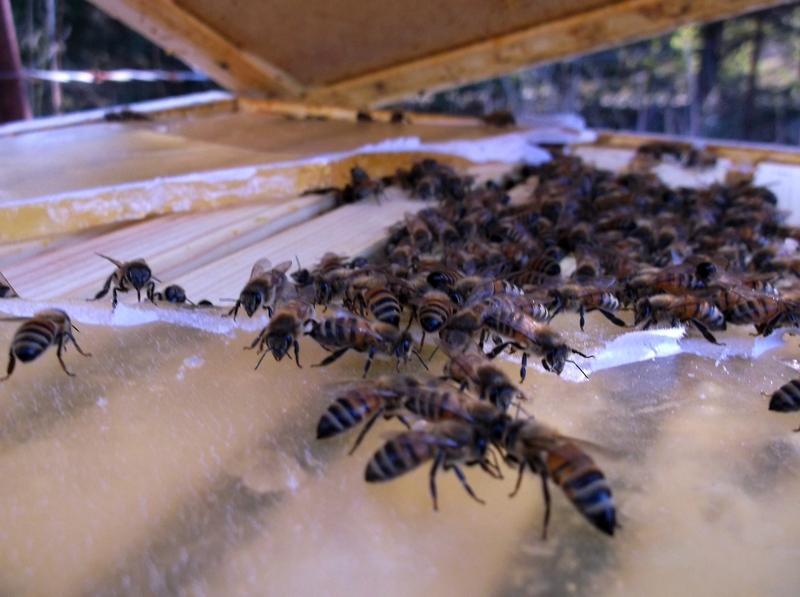 Once the weather was nice enough, the bees were toward the end of a big hatch. I had tons of capped brood but not many eggs and larva. 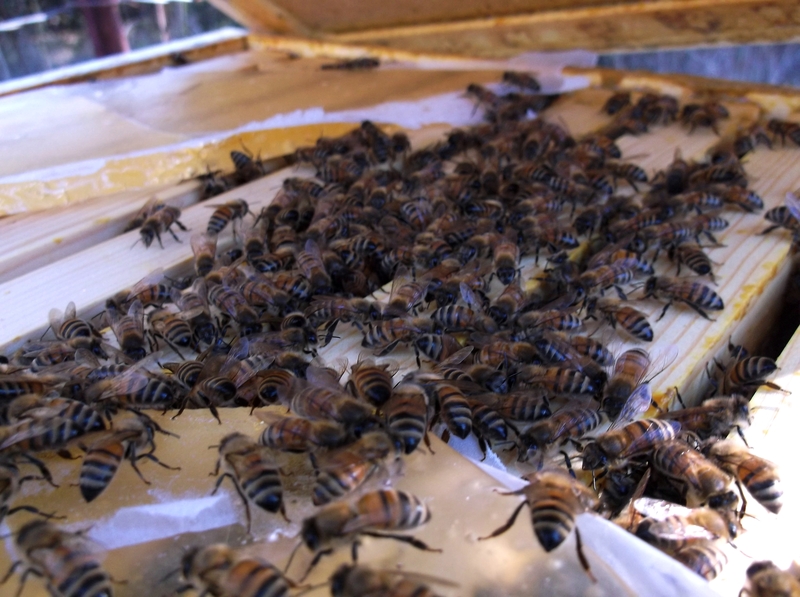 I did see a few good candidates so I pulled three frames from one of my existing hives that was in good shape. From it I took three frames. Two had capped brood, a few eggs and a few larva. I also took an additional frame of honey and pollen. 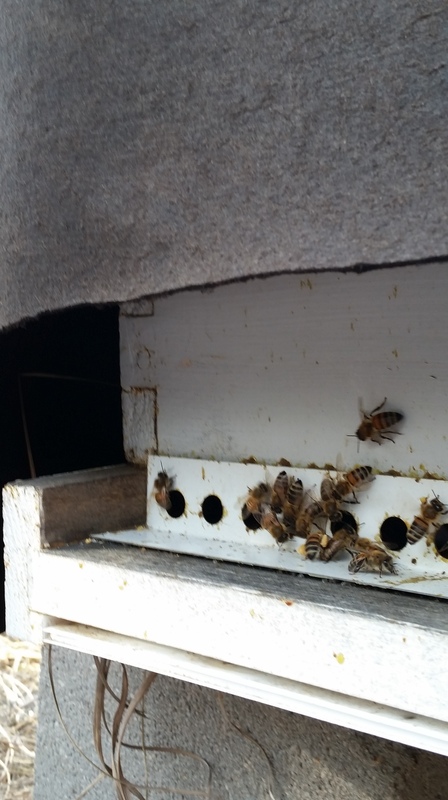 I transferred the frames to the nuc box above with all of the bees remaining on their original frames. I shook an additional frame or two just to make sure I had enough nurse bees to take care of the developing brood. After 3 days, I took a peek at the nuc because they had consumed a full quart of 1:1 syrup within 24 hours. They had already begun a few queen cells. I hope that at least one ends up being viable. I fed once more on day 3, but I will probably cease feeding as it seemed to induce robbing almost instantly due to the other hives within the same proximity. 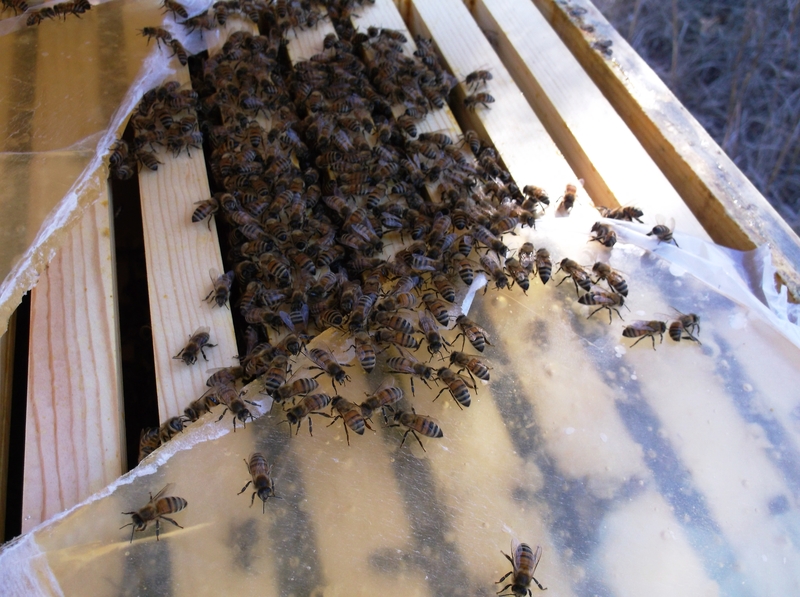 If they continue to need fed, I will need to bring the nuc back to my home away from the bee yard so I can feed it well and keep a close eye on the queen build. I cannot help but brag on these guys. 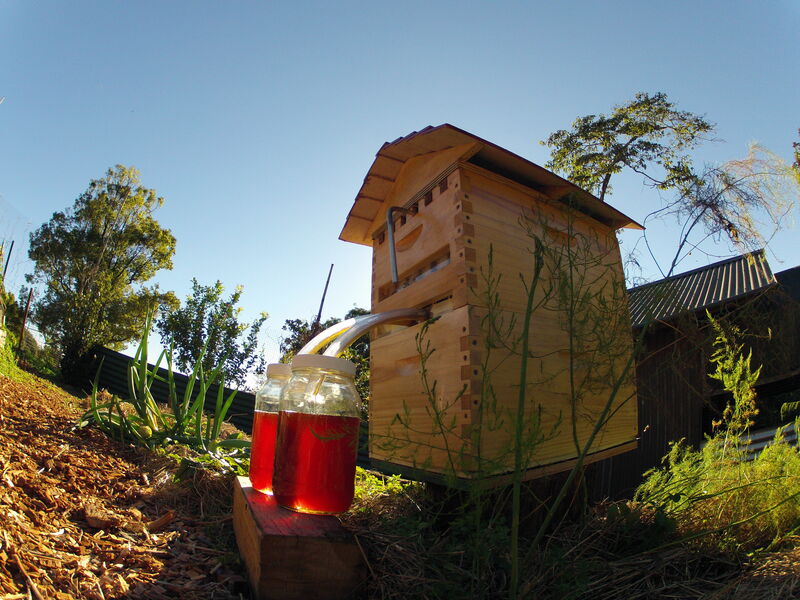 I always said that if you want to get rich as a beekeeper, design a hive with a honey tap built in. I believe in the American Dream and these two are a true inspiration. They raised 2.1 million dollars in the first 24 hours of product launch. That is a combination of sales and donations on their site. Please feel free to go check it out. Way to go boys !!! Earlier this week on 1/27 we had some excellent weather here in south central Kansas. Temps hit 70 degrees and the bees became very busy. They were very gentle this day so I layed down to take a few pics. When I got down there, I realized they were bringing in pollen. What a great site. It may only be some grain dust pollen or something laying around, it was still a welcome sight. I hope we’re almost out of the hard freezes here. I have kept good fondant feed on my bees this winter, wrapped them with roofing felt and kept a water source very close to my hives. I’m hoping that these steps have helped them survive. So far, all is well !!! Well, my fondant turned out more like hard crack candy, but I’ve heard of beekeepers using this same type of feed in their “candy boards,” so I simply took my hard candy winter feed and placed the pieces over the top bars of my three hives, which gave each hive about 3 lbs. of candy. To my amazement, the bees immediately went to work on it. I plan to check on them in about a month to see if they need replenished. 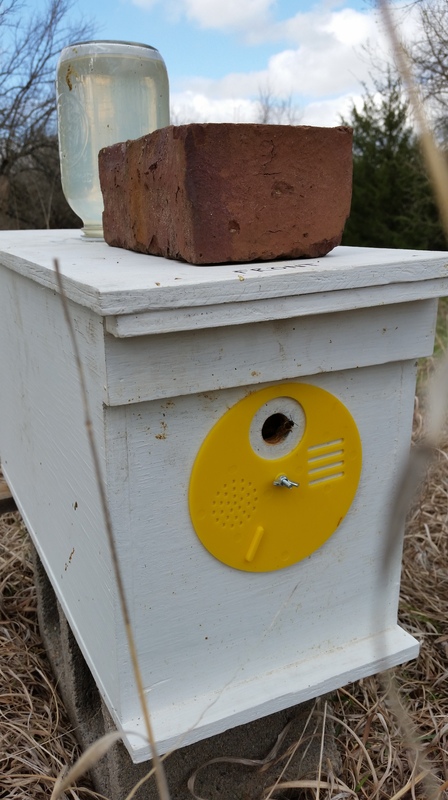 The hive in the photos has the candy laying directly on top of the frames, but in my other two hives, I used some shim style feeders that I made last year. I think the shim feeder is the better option for winter feeding. I will grab photos of them next time. I was trying to be quick today. It was about 60 degrees when I was in the bee yard, but the wind was blowing so I kept the photo shoot to a bare minimum. I also made tar paper covers for all three hives for winter, but I forgot to take a photo. Maybe next trip. Stay tuned and join with my in hoping and praying that my hives all survive this winter. I apologize for the slow posts this season. I’m not sure how any beekeeper would ever have time to keep up with a blog at the same time. I would consider this season a success. 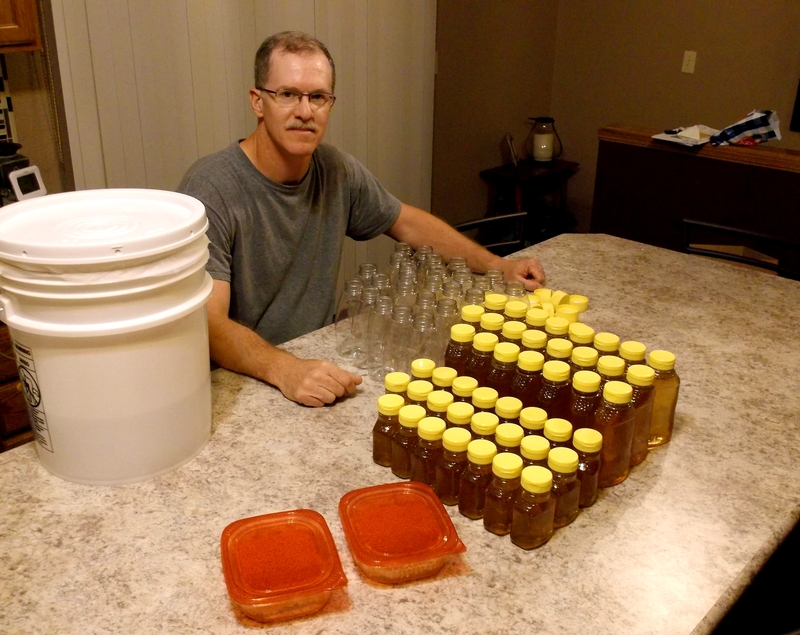 From my two strong hives, I pulled a total of 76 pounds of honey. I wish I could have filmed the fight. Several times I thought the bees might actually beat me. Bees just don’t understand what’s happening when you take their honey. It seems sort of cruel, but I feel confident that I left my two hives plenty of honey and plenty of time to collect honey stores to get them through the winter. And while I do not feed while the honey supers are on the hives, I will offer some supplemental food in the late fall/winter. Thank you to everyone who has purchased a bottle of my honey this season. I really appreciate your business. This has been an expensive but very interesting journey and I do plan to keep it going.